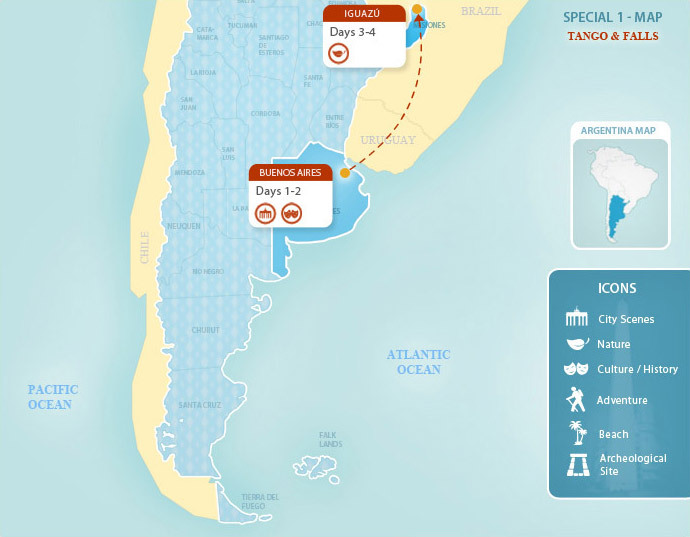 Taste Argentina’s flavor during an exciting Argentina vacation package to Buenos Aires and the spectacular Iguazú Falls. Buenos Aires, nicknamed “The Paris of South America,” is one of the most European cities in all of South America. But of course, as the capital of Argentina, Buenos Aires also has a distinct Latin American feel. Tango houses delight and dazzle visitors nearly every night of the year, and every spring ambitious Latin American tango dancers compete in elaborate, highly-energized tango dance competitions. Straddling the Argentina-Brazil border, the biggest falls in all of South America can be found. The Iguazú Falls lie about 11 miles upstream from the confluence of the Rio Iguazú and the Río Alto Parana. Declared a World Heritage Site by UNESCO in 1984, the Iguazú Falls and the surrounding grounds are preserved in two stunning national parks. In the San Telmo neighborhood, the heart of tango, you will learn about the history of this beautiful, sensual dance that has become the symbol of Argentinean culture. Finally, you will visit Palermo and Recoleta, the city’s upscale neighborhoods where the Portenos (inhabitants of Buenos Aires) come to indulge in high class shopping and gourmet cuisine. Enjoy a free day in Buenos Aires to explore this dynamic capital on your own, or browse our exciting additional Buenos Aires tours to enhance your experience. Transfer from hotel to airport and flight from Puerto Iguazú to Buenos Aires. Alternatively, check out our many exciting additional Puerto Iguazú tours and activities to keep exploring this impressive destination, or browse our full range of Argentina travel destinations for other Argentina vacation options.